You have probably heard of quinoa before, but you probably didn’t know that it is a close relative to beetroot, spinach and tumbleweeds (it is not a grain). It is considered to be a lo-carb, gluten free superfood because of its high content of protein and nutrients like iron, magnesium, copper, manganese and phosphorus. Red quinoa has a crunchy texture, which I prefer over the white quinoa. I usually cook one cup of quinoa and add it to my salad. The following recipe incorporates red quinoa into one of my favorite dishes – spring rolls. This is perfect for a hot summer day, or when you just want to eat something light and fresh. Rinse and cook the quinoa as instructed on the package and let it cool off when done. In the meantime, cut the cucumber, scallions and avocado into sticks. Mix the dressing and then pour over the quinoa. 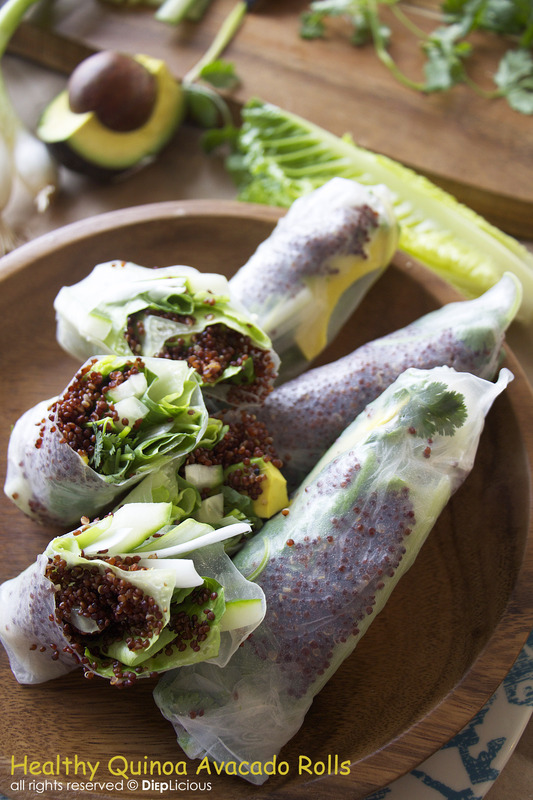 Add the vegetables and quinoa at the edge of the rice paper closest to you, and roll in the direction away from yourself. 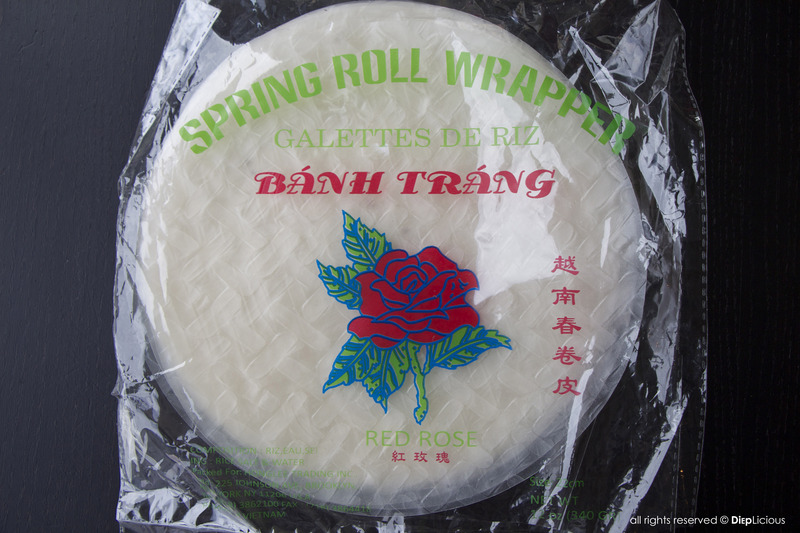 When it is rolled halfway, close the edges on each side and continue to roll until the spring roll is closed. Voila! You just made your first spring roll. Continue on the same way to make the rest. Tilbered quinoaen som anvist på pakken og lad derefter quinoaen køle af. I mellemtiden skæres agurk, forårsløg og avocado i strimler. Bland dressing ingredienserne sammen og hæld dernæst over quinoaen. Tilsæt grøntsager og quinoa på kanten tættest mod dig selv, rul halvvejs og luk dernæst kanterne på hver side og fortsæt igen med at rulle indtil forårsrullen er lukket. Voila! Du har lige lavet din første forårsrulle. This looks delicious! 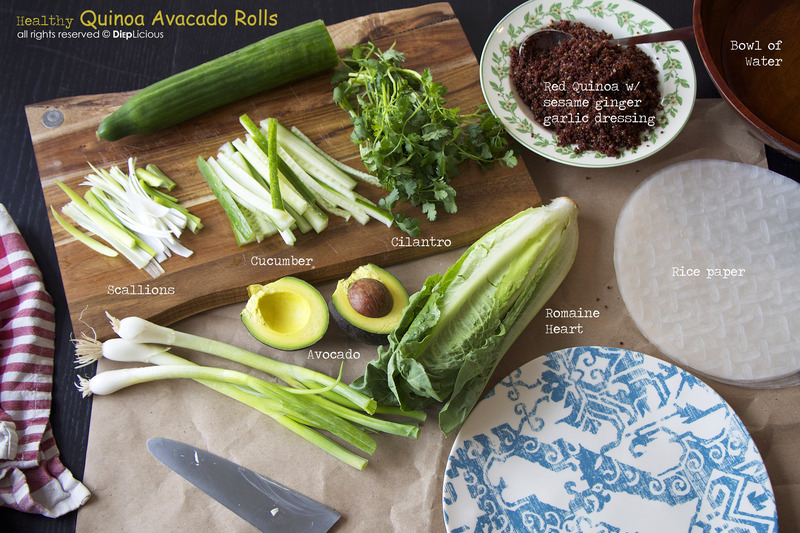 Definitely going to give these spring rolls a try! Thanks for sharing you recipe! Thanks Kristin, You can also do like I do and put all the ingredients out on the table and let your family or friends make their own spring rolls. It is a fun way of eating (and less work for you) and you feel good about eating it as well.